adidas Runbase Milano by DINN! More than a design store. 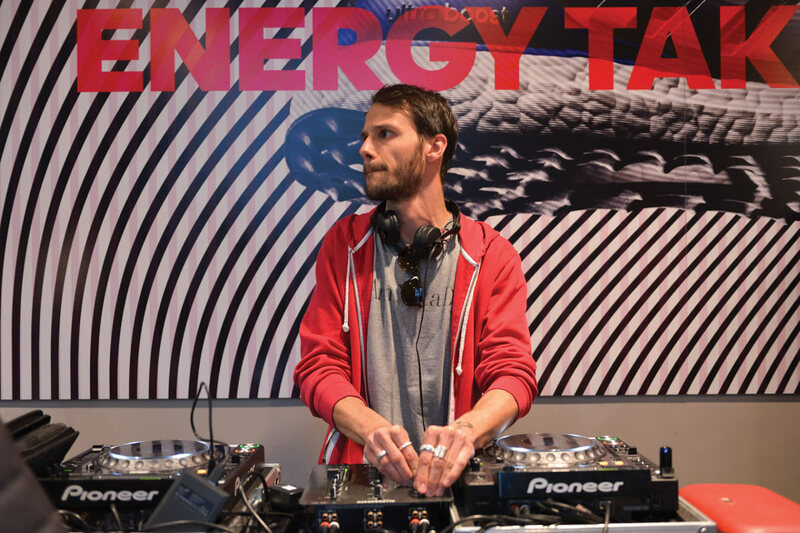 A special retail “store”, inspired by the energy and strenght of its Energy Boost sneakers, thought to redefine adidas customer experience and elevate its brand positioning and market share. 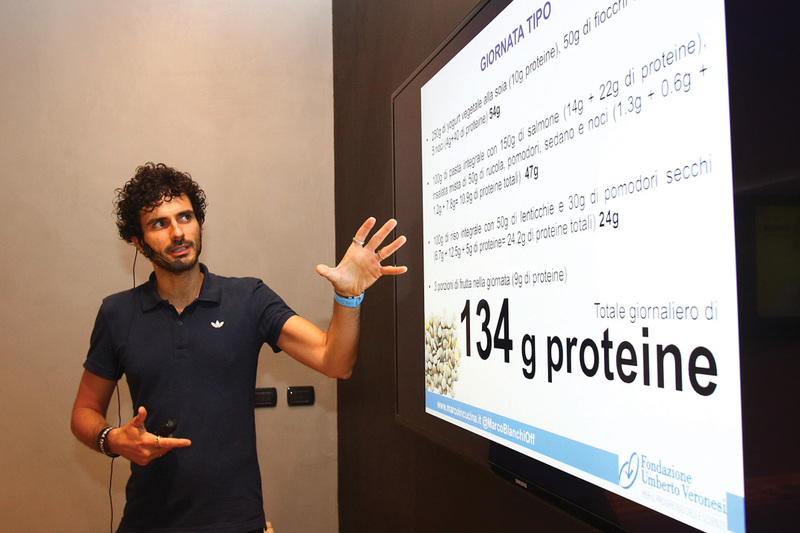 Running has been steadily winning the active urban population back in major cities around the world, and Italian runners need their temple of running in Milan. 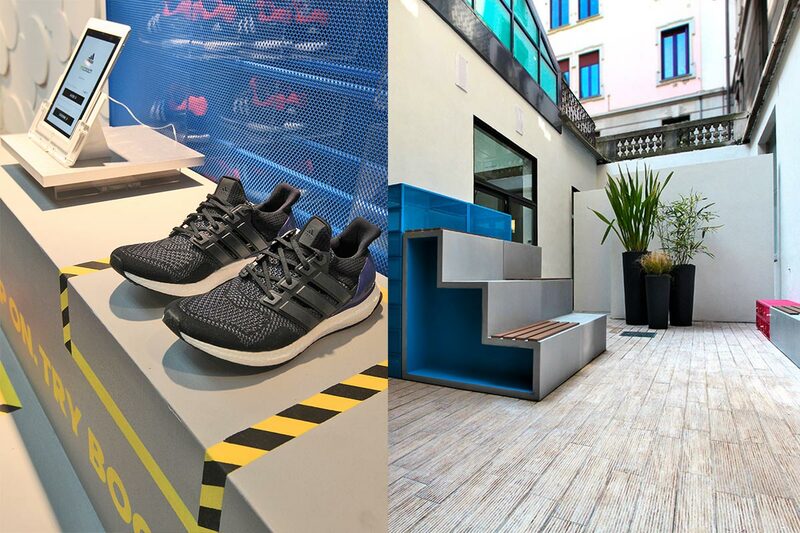 adidas does not want to lose its edge in the running culture revival and has taken advantage of the increasing popularity of running in Italy (6 million people) by opening a new experience store. 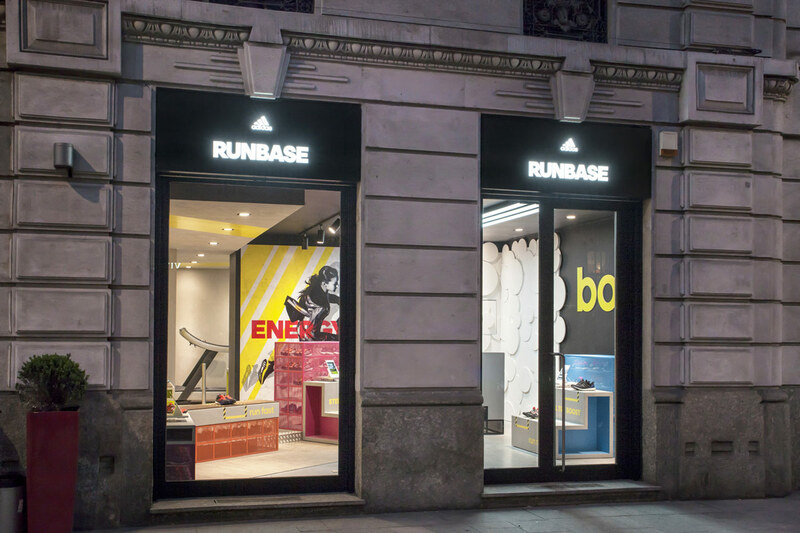 After Tokyo, Berlin, London, Moscow and Boston, adidas Runbase arrives in Milan and has DINN! signature. — adidas into the world. While other international Runbase are designed according to a retail perspective – come in, try and buy -, adidas Runbase Milano breaks these traditional schemes. A place that helps to understand and perform what it means to run with adidas recreating those feelings that people live during a city running. 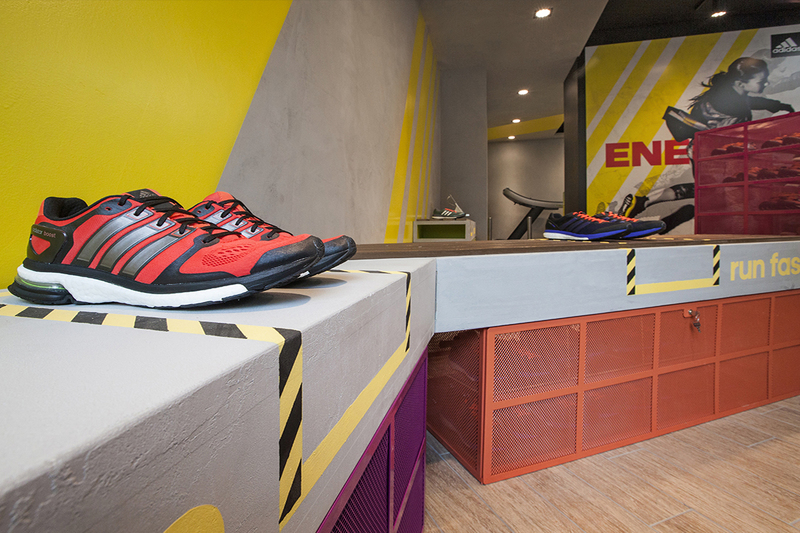 A new experience store which let runners feel the best of adidas brand. 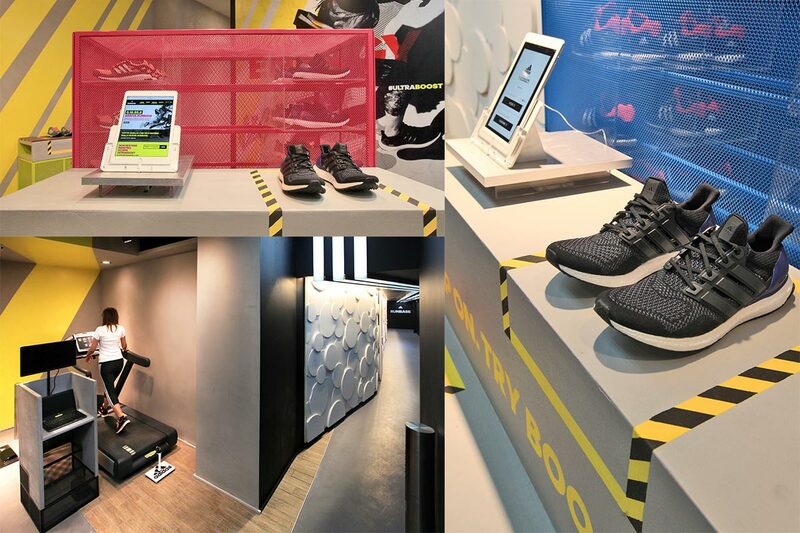 adidas Runbase is not a store as any but a landmark where people live a totally running experience in an immersive runners haven featuring state of the art workout equipment. It is a place where the runners are the protagonists and where the brand and product come together into a new urban running experience. Marco De Carli, CEO at DINN! 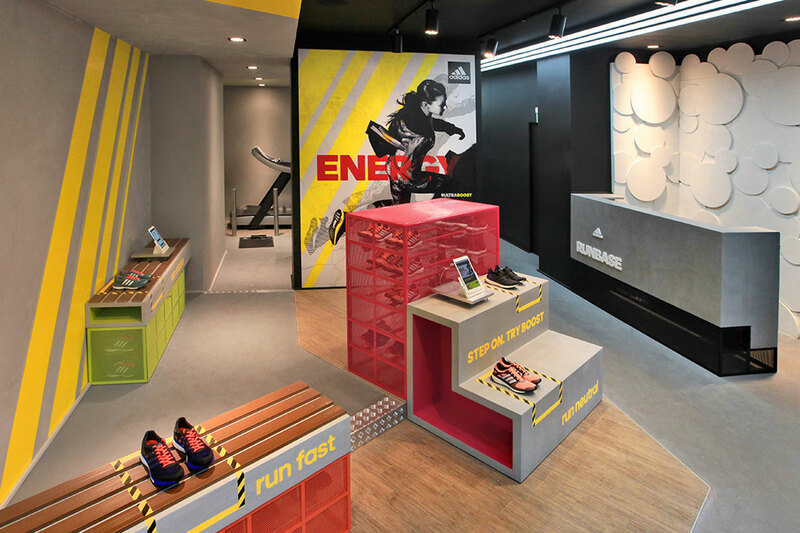 adidas Runbase Milano was conceived to be a runners hub in Milan in order to entice runners of all skill levels and experience. A key place in the city able to involve different types of runners, from the addicted one to newcomers, in various initiatives – marathon, seminaries, water run… and more – and where you can discover, feel and do a complete adidas running experience. An adidas expert welcomes you and shows you all the latest adidas products. He makes you try the foot’s support test in order to understand what kind of shoe suits you best. He gives you the more suitable for you and suggest you to try it to the nearby Parco Sempione. The shopping experience is not lacking, you can do it through other touchpoints. 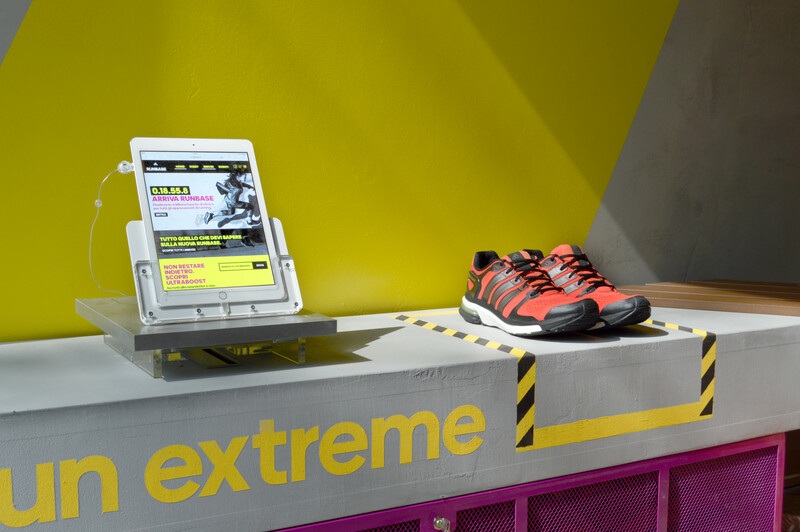 Different tech-powered features of the store include the already mentioned foot’s support test, – which reveals the best solution of running shoes for each runner based on his feet- and the official treadmill where the customer can simulate a piece of running before choosing the item. Enter into the Runbase, change your clothes, go running in the park. Meet there other runners for the training sessions with adidas experts, then go back to adidas Runbase to take a shower. This means living a new running experience. There is time to buy, you can do it also at home. 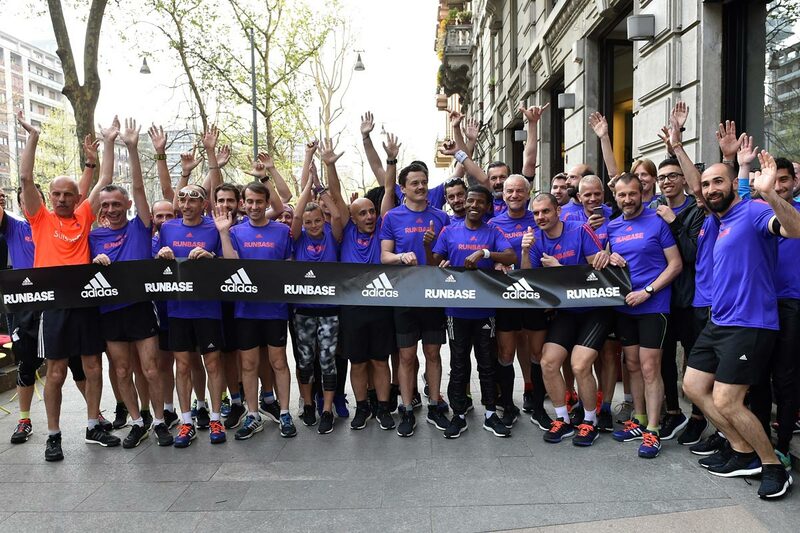 adidas Runbase Milano represents a real landmark for all runlovers. A new retail era where the design can innovate the brand through a new service design approach. 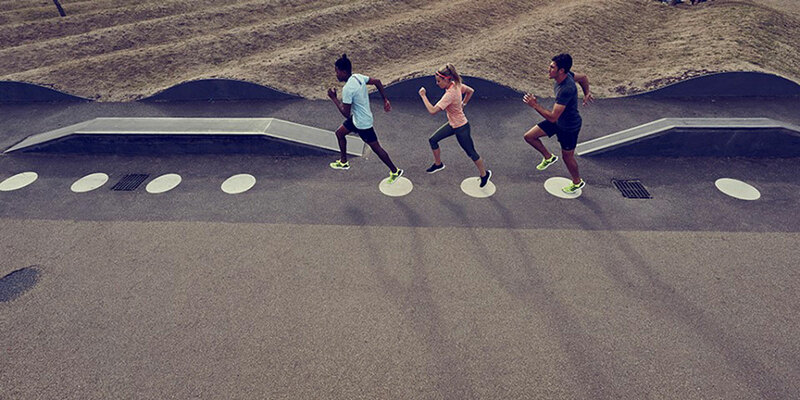 It pushes competitiveness in the market through this new full-immersive consumer experience that is able to change the role of the space, from a product consumer experience to another one more focused on runners’ benefits and feelings. Designed as a customer experience store, the new adidas Runbase is branded in vibrant colors that inspire just about anyone to go for a run. The space has to be energetic, urban, attractive, engaging just like its new technology, Energy Boost. Energy is the tone of voice of the space. Claudio Viscardi, Design Director at DINN! All the space has been thought and developed in line with adidas style and colors as well as the purpose of enhancing the city running. To establish a stronger context of the city, the interior design elements have also been thoughtfully charted out. The relax area is set up with comfortable wooden benches which give the idea of being at the park, while the store signage reminds one of street signage, and the use of cement on the floor which is indicative of the rough floor of the city. We have changed the focus, from a design style to a design to innovate approach with more attention to business results. The design is a strategic asset for brands in order to bring success to their positioning and competitiveness. 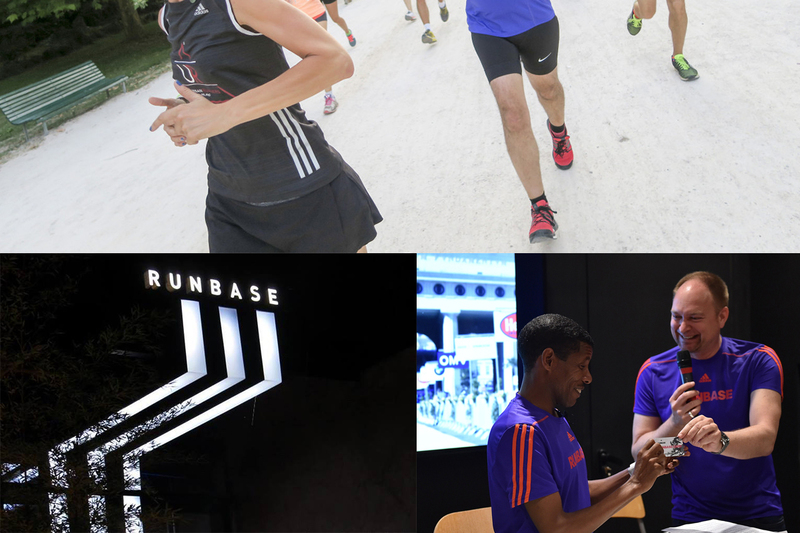 — adidas Runbase inauguration with Haile Gebrselassie. 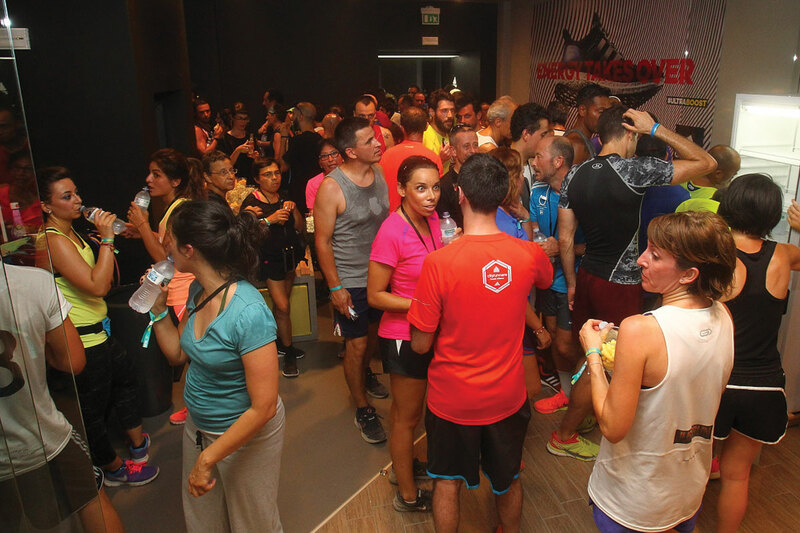 Located just few steps from Parco Sempione, the most ambitious place for city-runners, new adidas Runbase opened in April of 2015 with a guest of honor Haile Gebrselassie, one of the premier athletes boosting the brand’s running program. An exclusive design and banking experience for affluent clients. New stores design to reinvent the customer experience. An intensive workshop among the latest innovations in the retail world.